To many householders, most ants look pretty much alike. In truth, dozens of different species occur around homes and buildings, each having distinct characteristics which may influence the method of control. In Kentucky and much of the Midwest, common house-invading ants include pavement ants, carpenter ants, acrobat ants, pharaoh ants, and odorous house ants. The latter species has become such a nuisance in recent years that it will be discussed in some detail. 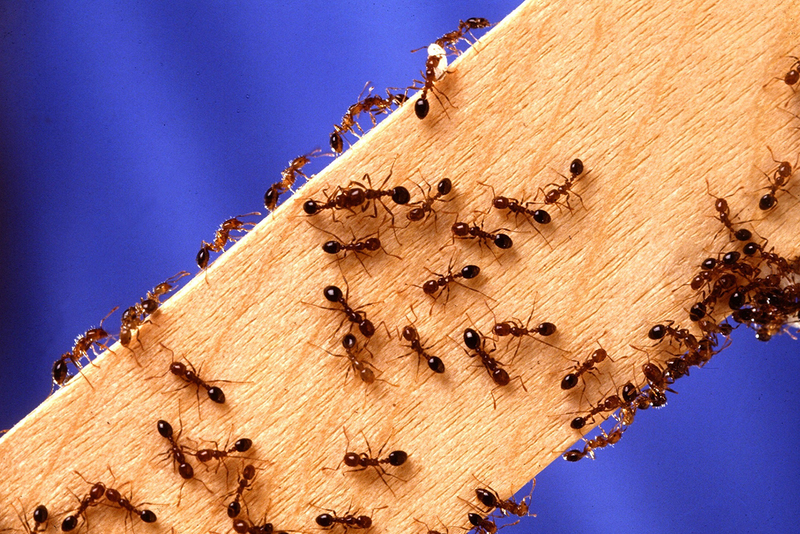 Knowing which type(s) of ants you have often requires the help of an entomologist or knowledgeable pest control firm. Collecting a few of the non-winged ‘workers’ in a plastic bag or vial will help with subsequent identification. Ants are social insects that live together in cooperative, intermingling colonies. The colonies may range in size from hundreds to millions of members, depending on the species. Within each colony are different types of individuals, each with a specific function. All ant colonies contain one or more queens whose primary role is to lay eggs. The eggs hatch into white, grub-like larvae that later transform into adult ‘worker’ ants. The workers feed and care for the queens and developing brood, and are the ones seen foraging for food and water, often at considerable distance from the colony. Ants lay down invisible odor trails, which the workers follow between food and the nest. In many cases, the trail of ants is distinct enough to be followed back to the nesting location, or to where the ants are entering from outdoors. At certain times of the year, ant colonies produce large numbers of winged individuals known as ‘swarmers.’ These winged ants emerge from the nest to mate and establish new colonies. When a swarm of ants emerges indoors, it's an indication that a nest is present. Fortunately, the likelihood of swarmers establishing a new colony inside a building is low. Nonetheless, an exodus of winged ants appearing indoors can be disturbing, and is often mistaken for termites. Winged ants can be distinguished from termites by comparing certain features. Ants have a narrow (pinched) waist similar to wasps, whereas termites are virtually the same width from end to end. Ants and termites each have four wings; however, on ants the front wings are longer than the hind wings while on termites all four wings are of equal size and length. Finally, the antennae of ants are bent or "elbowed" whereas termite antennae are straight.